Let’s get straight to the point. Winter in Chicago is not a season that you are supposed to enjoy. The bitter cold and the wind will try to freeze you every morning on your way to class and snow will make you feel as a national geographic explorer on your way to Econ 201. 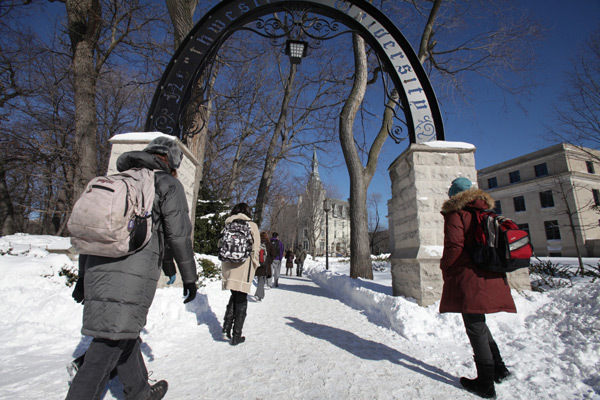 However, as I have discovered in the past year and a half, Northwestern tackles winter like no other place that I’ve lived. The energy of college students is definitely not dampened by Mother Nature. If anything, it makes us more proactive in organizing social gathering of all types throughout the winter. Also, from January to March, there are countless events including musical and theater performances available to us on campus. By attending some of these events last year, I realized the world-class level of our performance groups on campus. If you are into sports, and honestly even if you are not into them, going to a Wildcat basketball game is always fun. Hundreds of students go to Welsh-Ryan to see our team play and the experience is always a highlight of my week (plus, they almost always give away free swag!). For foodies like me, winter is the perfect excuse for some restaurant exploration in Evanston. There are so many options that a whole quarter is almost not enough time to visit every single one. Planning ahead is essential though, because on Friday nights many restaurants tend to get crowded with Northwestern students and getting a table can be hard. Winter itself opens up a few other options that are normally not available the rest of the year such as ice skating. If you are a pro, or a rookie like me, the ice rink that opens up on the Norris East Lawn is a good option in order to see your friends hopelessly crash on the ice. Although winter might not be my favorite season, spending it here at Northwestern is definitely a better experience than what most people get.